Wednesday, June 3, 2015: Up and on the road at 0740 which marks the earliest start in quite some time. Kit and I thoroughly enjoyed Fort Abraham Lincoln State Park in Bismarck, North Dakota and intend to return in the future…..lots to see in this area! It is 51 degrees and a bit cloudy as we roll into the countryside finally connecting with I-94 which led us easterly. Since we had bailed before breakfast, Kit and I decided to pull into a nice Perkins Restaurant in Jamestown, ND for a quick meal before continuing our journey toward the east. So, what’s the hurry? It goes back to yesterday, when I asked the bride where she wanted to spend our special anniversary and she answered; “Bemidji”. To which I replied “Gesundheit”. Nope, seems as if Bemidji is a small town in northern Minnesota that Kit has had a secret desire to visit…..and it’s nearly 400 miles to the east, a long haul for the way we travel! So plotting a course for Bemidji we focused on arriving before dark. Fortunately, since we are on a mission, there wasn’t much to distract our attention until we encountered Fargo, North Dakota. Seemed like a neat place to explore but the fact that every other residence had a wood chipper in the dooryard was a bit unnerving. So we quickly moved on crossing the Minnesota border shortly around noon and pulled into the visitor’s center for a break. 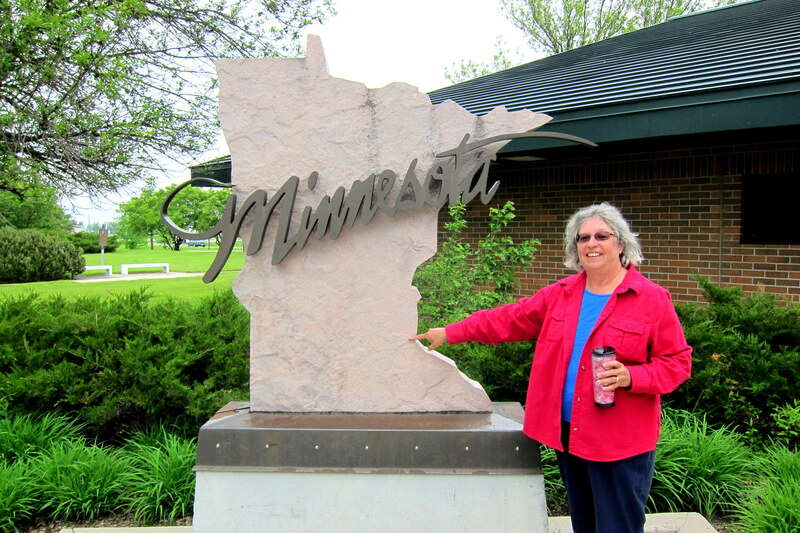 Kit was born in Rochester, Minnesota which she is proudly pointing out in the photo above. Her family left the state when she was nine years old and moved to California. Good thing for me as we would have never met otherwise…..life is funny like that. Of all the people in the world, what makes two specific individuals meet and connect?!?! Back underway, we drove a variety of local and state roads as we meandered our way to the northeast and our headquarters for the next few days. 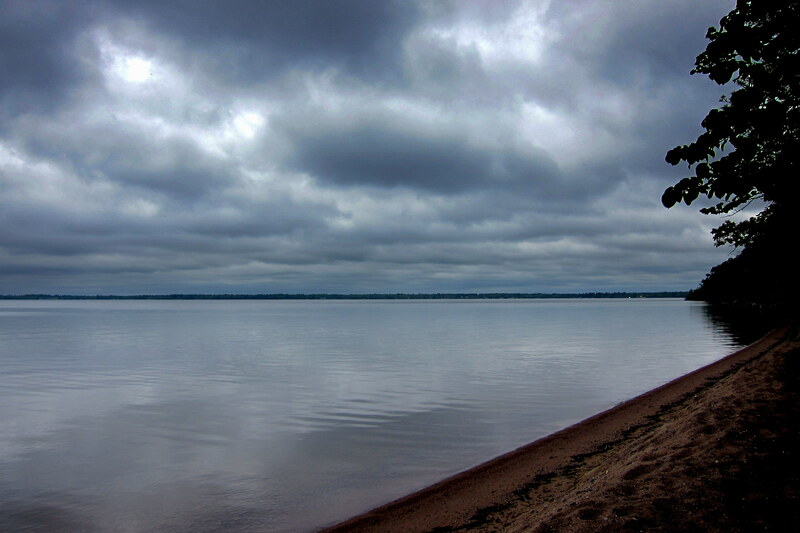 Being mid-week Kit and I were able to select a nice secluded site at Lake Bemidji State Park. Setting up camp and a great dinner followed by some wandering around the campground led to our turning in for the evening. 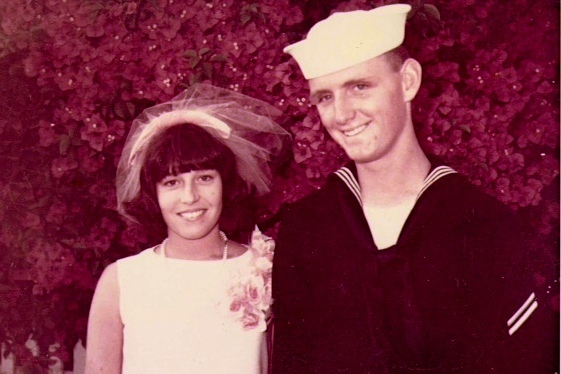 On this day fifty years ago, two nervous teenage high school dropouts, stood before a California Justice of the Peace and were united in marriage. 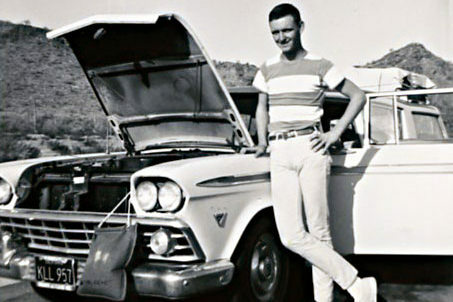 A few days later they loaded everything they owned in a hand-me-down station wagon, and headed cross country to Key West, Florida in order to begin a new life. There have been many joys, some sorrows, three great kids, five even greater grandchildren and other members of their family as well as many friends that have enriched their lives. 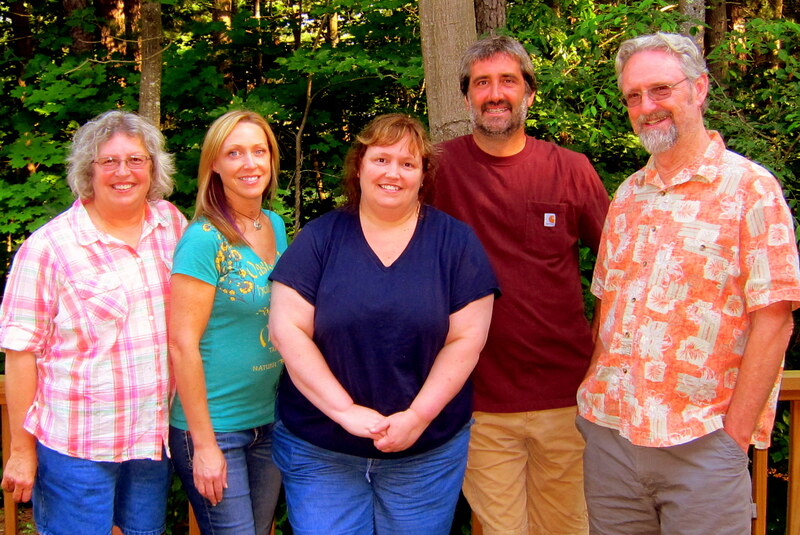 We love you all, and love each other even more deeply than on that warm summer afternoon fifty years ago. Thursday, June 4 and Friday, June 5 2013-Lake Bemidji State Park, Minnesota: Spent the better part of the two days in northern Minnesota exploring the area and reminiscing about the many wonderful experiences Kit and I have shared over the past 18,820 days we have been together. Our being on the road is the perfect way for us to celebrate this momentous event as our life has been truly nomadic……living in Key West, Charleston, San Diego, Virginia Beach and Barre, before finally settling in Brunswick. Then, factor in the various camping trailers we have owned over the past 45 years and used to share this great nation with our children and our lives have been an adventure as we rolled about the countryside…..and the journey continues! 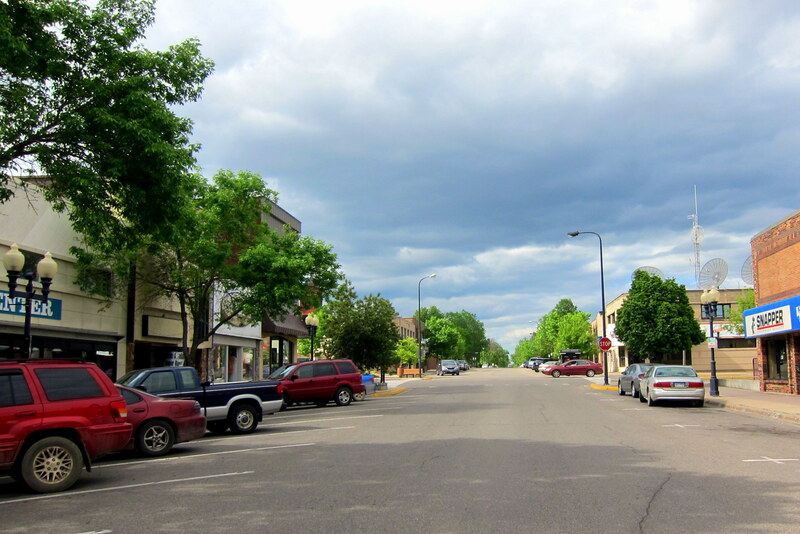 Kit and I spent one of our days in Northern Minnesota exploring the small town of Bemidji. Having a population of only 13,400 folks and at 14 square miles in size it is still the largest town in this rugged and sparsely populated region. While Kit perused the shopping opportunities I walked about town, talking to folks, gathering information and snapping photos. 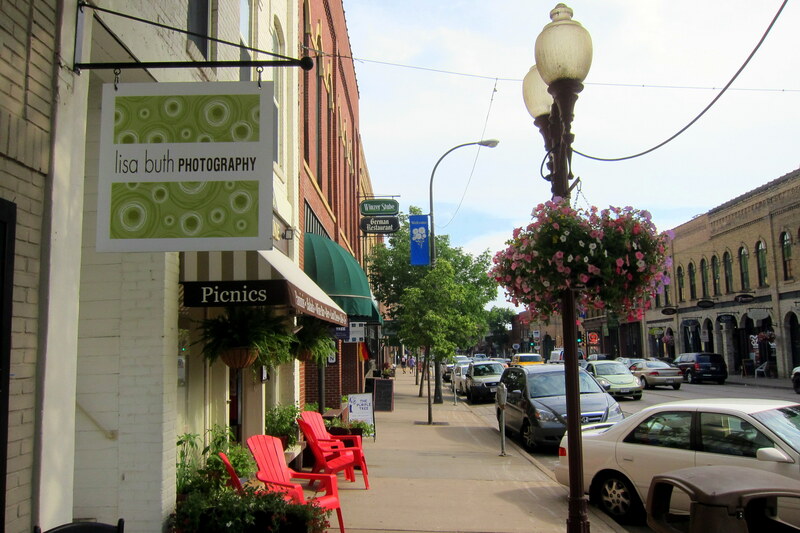 Bemidji has a thriving art scene and there are numerous public art displays spread throughout the six block downtown area. 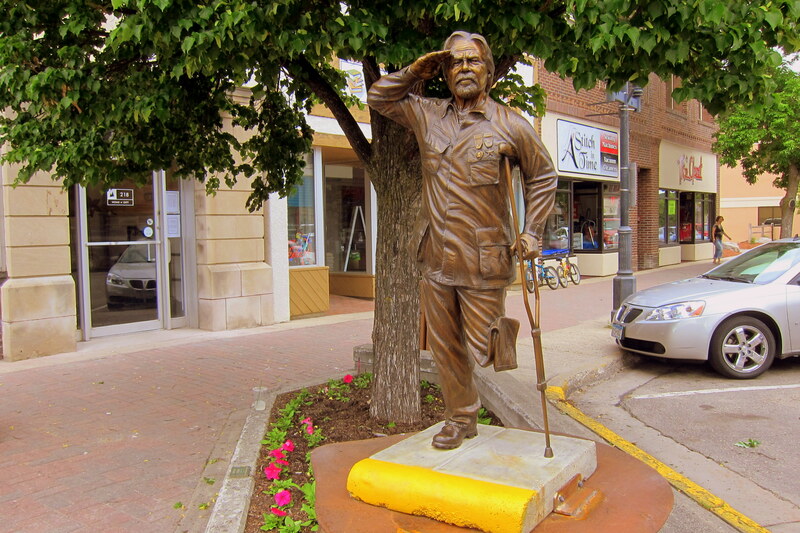 Many of these are bronze statues and the most poignant is a saluting Vietnam Veteran. Then there was the random citizen that wanted to get in on the fun and created their own backyard sculpture. Later we connected for an early dinner at the highly recommended Tutto Bene Italian Restaurant. 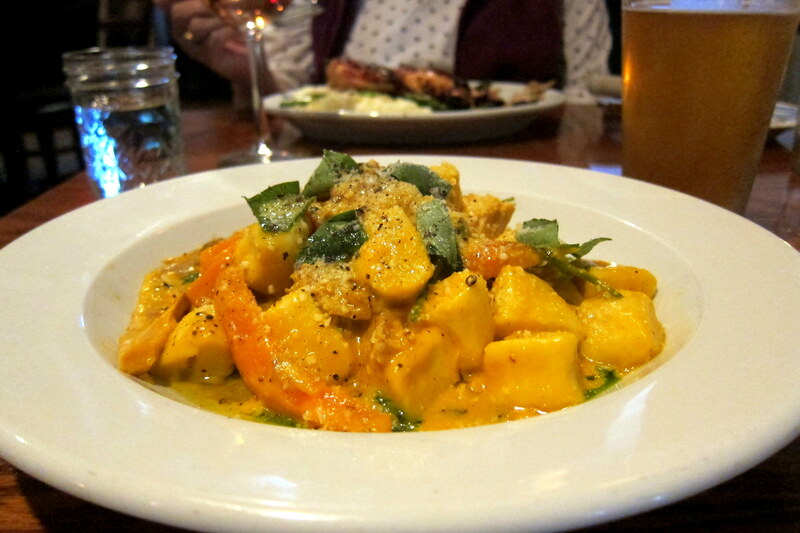 Kit selected the Chicken Saltimbocca and I ordered some of the best Gnocchi I’ve ever enjoyed! Back in the camper we finished off the evening with a few cocktails and some classy snacks. OK, this takes some splannin! 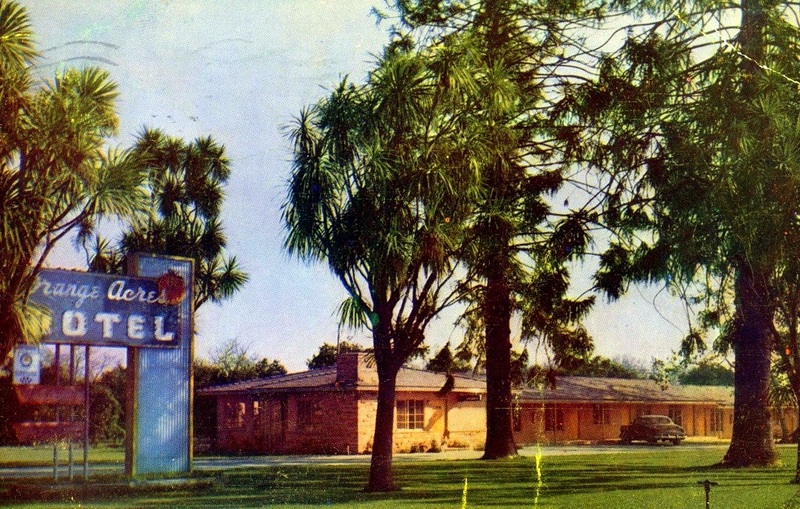 Fifty years ago we spent our honeymoon at the palatial Orange Acres Motel up near Los Angeles. The next morning Kit mentioned she was hungry. So now being the provider, I bravely went a hunting and gathering about the premises and scored a small box of Cheese Nips from the motels vending machine. Kit wasn’t impressed…..hey, what can I say, I had barely turned eighteen years old and possessed the maturity of a 13 year old! 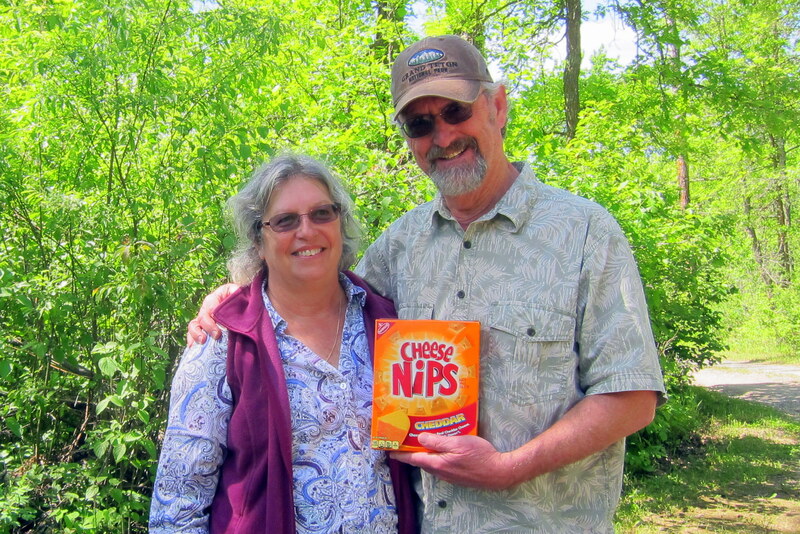 For many of the past 49 anniversaries, the Cheese Nip story is retold and vast quantities of the fake cheese cracker are consumed! Oh, and we had our first “misunderstanding” at exactly 18 hours into our marriage. Kit believed we should spend the day together and explore some of the cultural sights of the region and I wanted to get back to San Diego and go surfing with my buddies…..Kit won that argument, and most every one since! 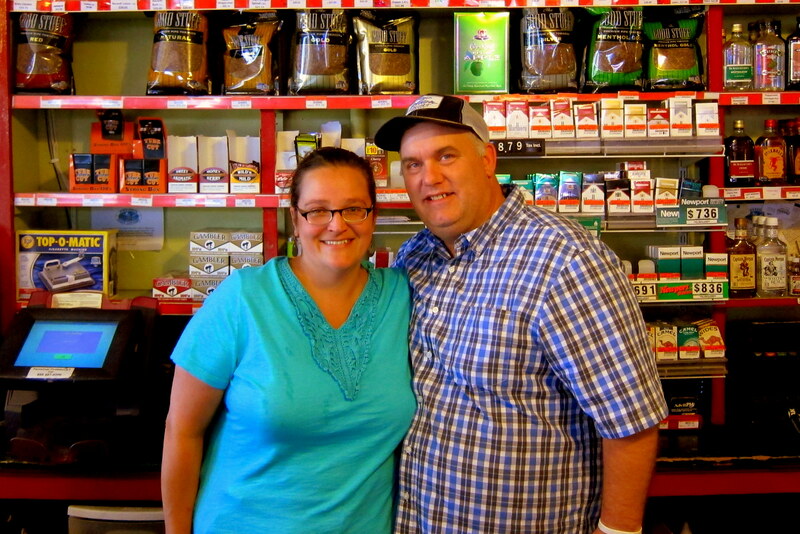 Yes, I knew I had married Ms. Right…..just didn’t know her first name was ALWAYS! On day two in Bemidji, we ventured a bit further away and visited Lake Itasca, where the Mississippi River officially begins its long meandering trip to the ocean. 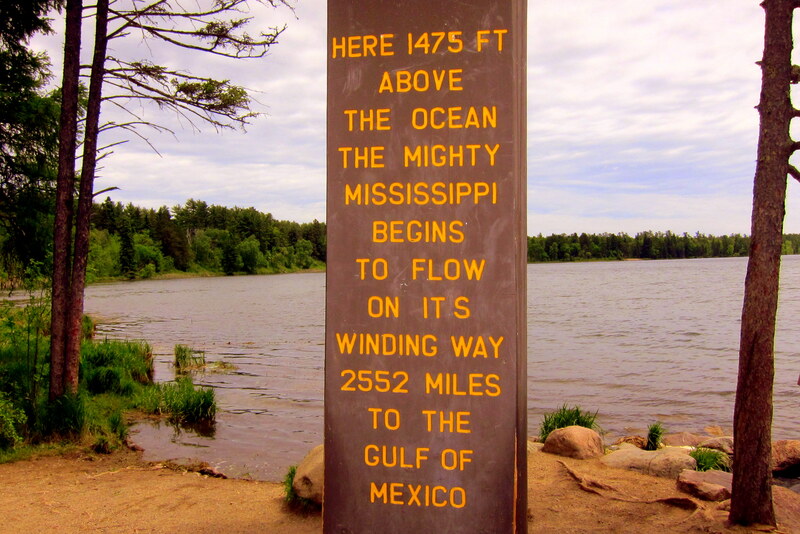 The Mississippi is the longest river in North America and its headwaters are formed by a vast watershed that drains an immense area of the US as well as parts of Canada…..well, that is the story anyway. However, in doing some poking around the woods near the supposed “headwaters” I discovered this item hidden in the bushes! 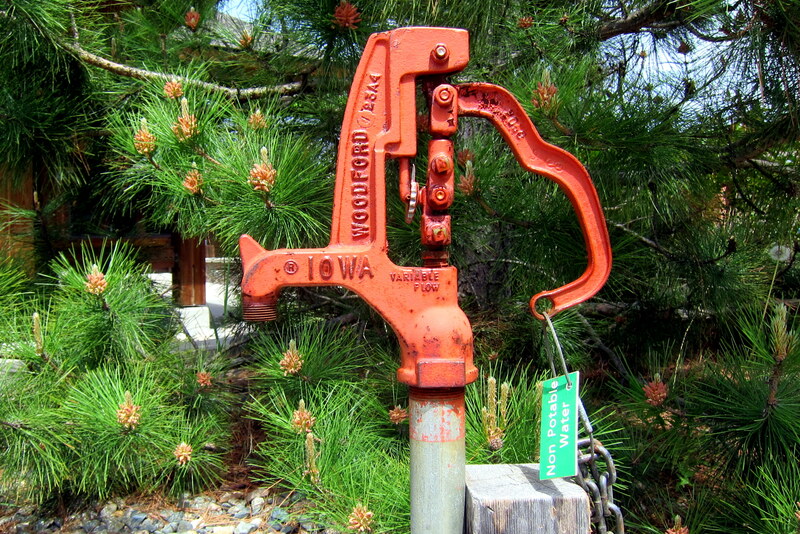 Yep…..I bet this faucet is actually the source of the mighty Mississippi! The Mississippi River is largely recognized as the east/west boundary of the continental United States and in the park one can walk across the very first bridge over the river…..here Kit and I are traveling from east to west. Until it was time for lunch which Kit and I enjoyed at a nice roadside pullout near a pretty little backwoods pond. 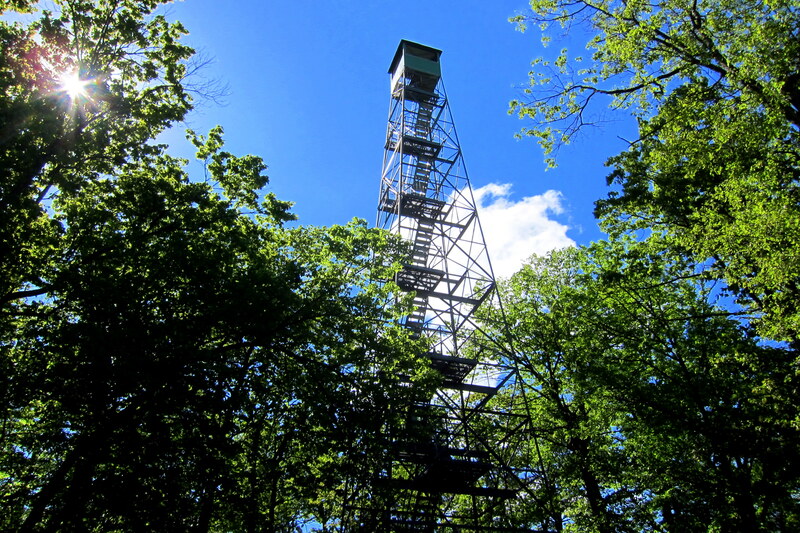 Following lunch, we were back exploring and came to a dirt road with a sign noting that an out of service fire tower was ahead, and I just had to investigate! 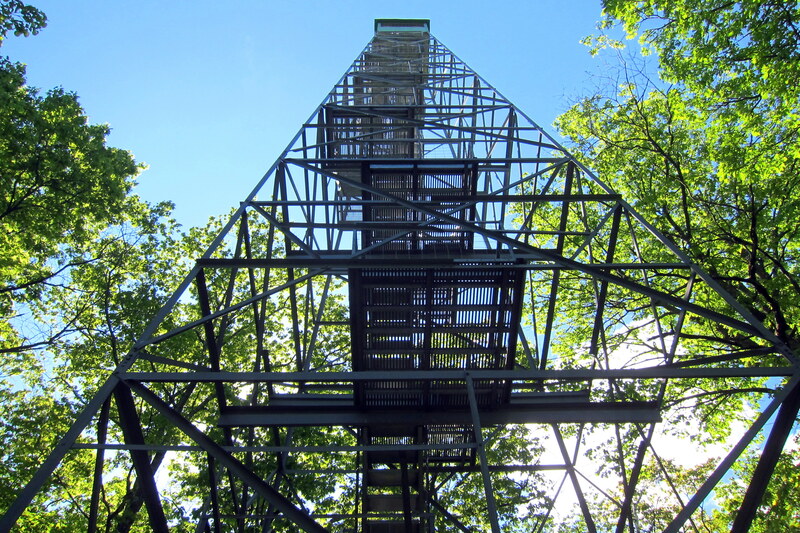 And a sign at its base said “climb at your own risk”. Kit decided to pass and I not having the same common sense, decided to climb. The views from the top were spectacular! However the tower did sway a bit in the breeze which was a bit unnerving, so I didn’t spend a whole lot of time gawking. It was a great day in a very nice state park. 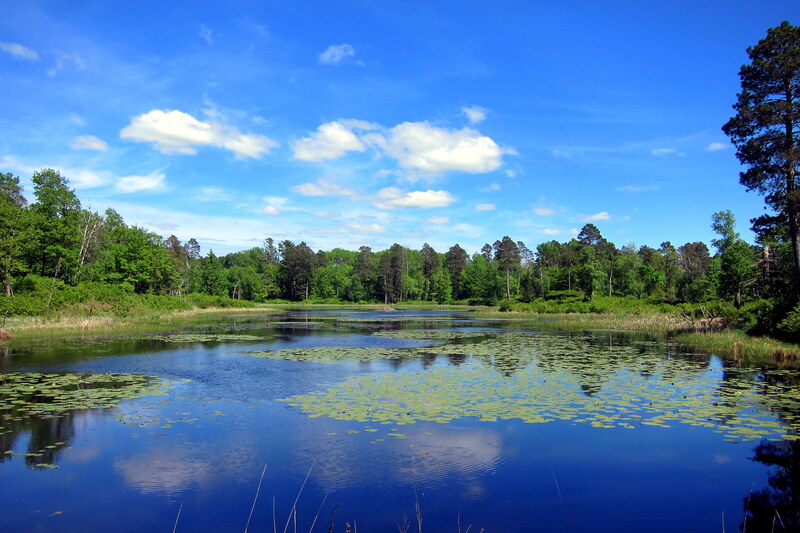 When we get back to this area in the future, we will likely stay in the campground at Lake Itasca State Park in order to fully appreciate the area. Leaving the park, we paralleled the Mississippi River Trail…..a multi-use trail system that follows the river to its conclusion in Venice, Louisiana. As it nears the Gulf of Mexico, the river fans out in a delta and many distributary channels are formed. However the main course bisects the city of New Orleans and is a major shipping avenue. There is concern that the use of man-made river controls are silting up this main artery and the flow is beginning to increase to a channel further to the west. This, of course, would have a devastating financial impact on the Big Easy! Plans are underway to redirect the river but face considerable environmental concerns. Back at camp, we agreed that it had been a great couple of days in the Minnesota North Country and yet another bucket list destination that will remain on the bucket list for a return trip! 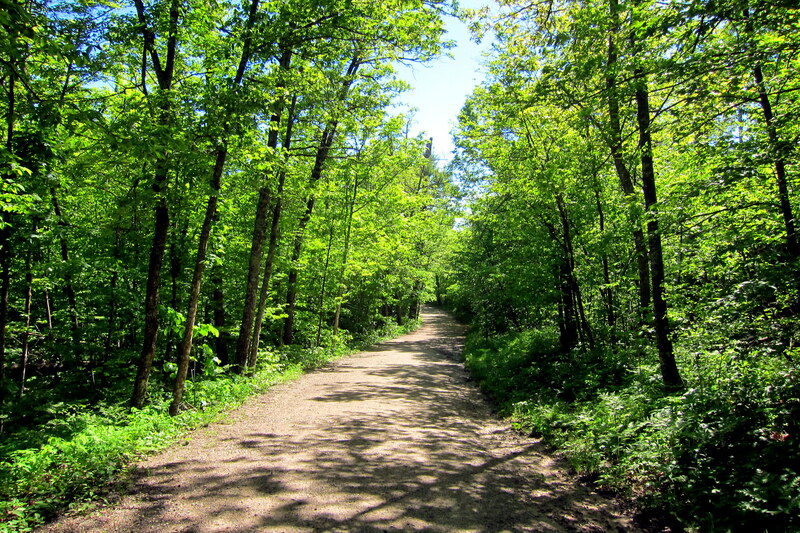 Saturday, June 6, 2015: Up early and after a nice breakfast, Kit and I took a walk about Lake Bemidji State Park before pulling out. 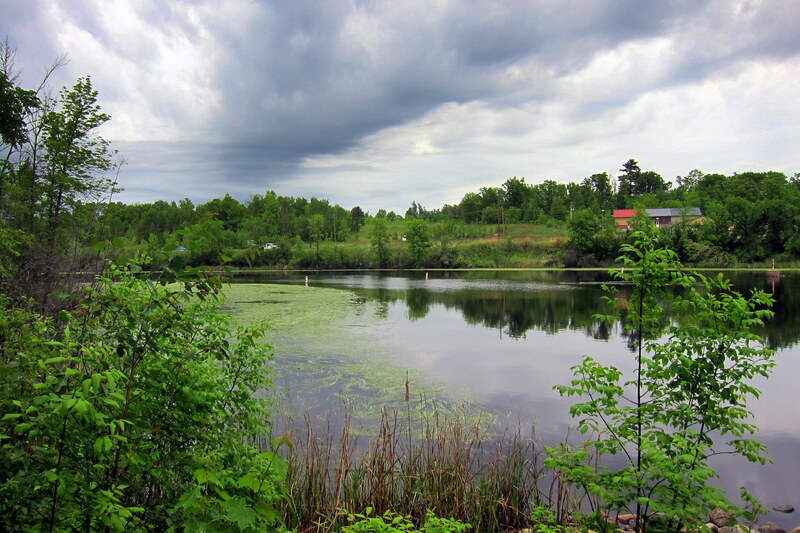 The temperatures were in the mid 60’s and the sky look a bit threatening as we explore the parks namesake lake. On the road shortly before noon we headed east on US Route 2 for our next destination, the twin cities of Saint Paul/Minneapolis and a return visit with Kit’s Minnesota family. Why head east? 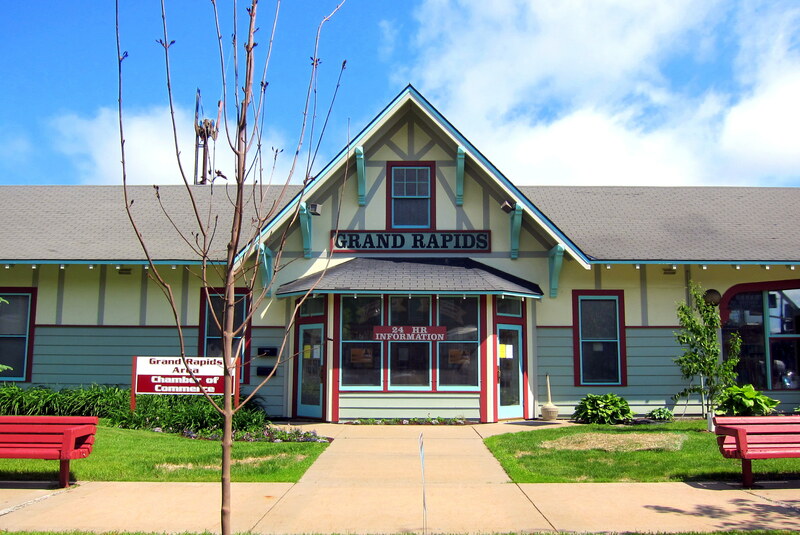 Well, Kit wanted to roll through the town of Grand Rapids……not the most direct way to the twin cities but a bit more scenic and a route we had yet to enjoy. 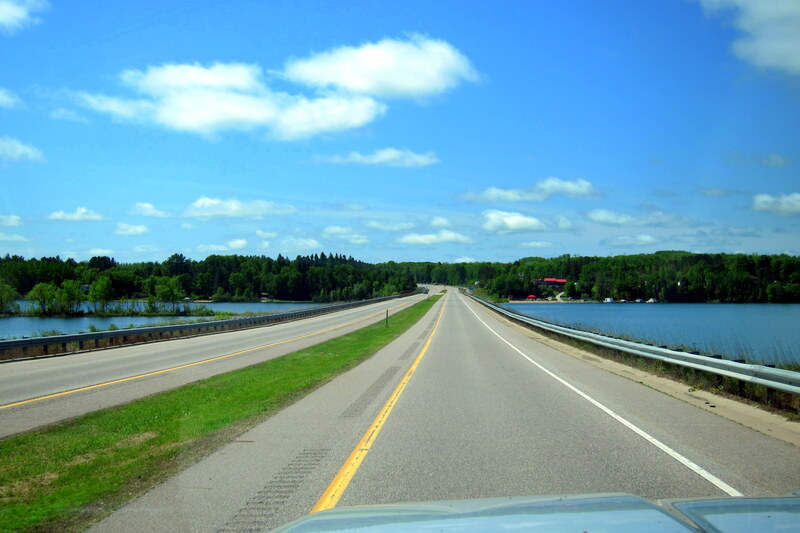 Within an hour, we entered the Chippewa National Forest and came to the shores of Lake Winnibigoshis and the Big Winnie Fishing Camps. Seemed like an interesting place to pull in for a look about, so we did! 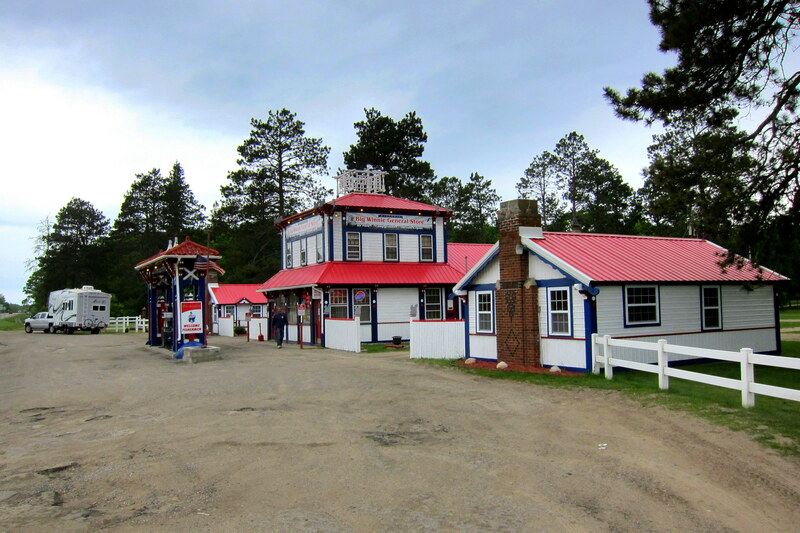 The store and lodge was constructed in the early 1930’s and is an example of classic Bavarian architecture, which is why it is listed on the National Register of Historic Landmarks. In addition to world class Walleye fishing, the camp has a few other reasons to be regionally famous. The story goes that a young architect and avid sportsman by the name of Frank Lloyd Wright was constantly asking for advice on fishing the lakes waters…..and the owner of the camp was asking for assistance in designing a structure in the Bavarian style to honor his German heritage. 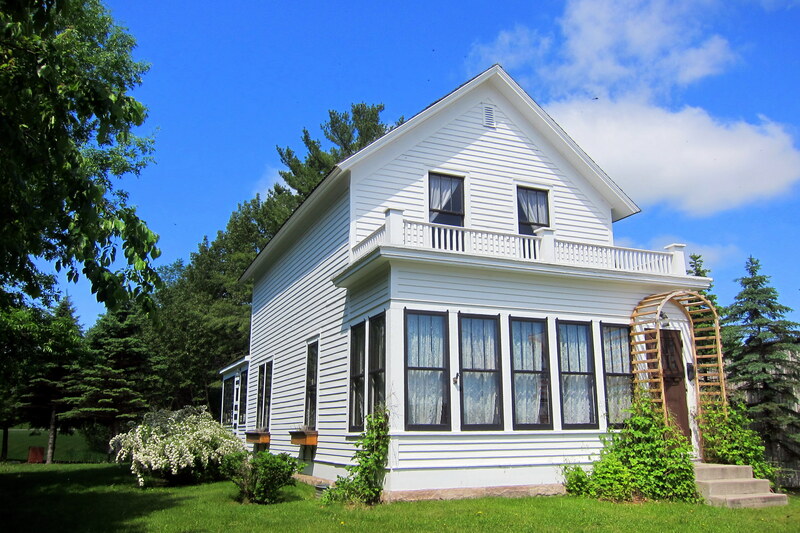 The symbiotic relationship resulted in this very unusual building in an area populated mostly by Ojibwa Indians and Scandinavian immigrants. The current caretakers of this classic Northern Minnesota fishing camp spent about an hour showing us around and telling the history and legends of the Big Winnie. One of which was its use during WWII as a POW camp. Located as it was in the isolated north with the challenging weather, it turned out to be a perfect place to house detainees. Cold kept them close in winter and mosquitoes had the same effect in the summer. After a great visit, we eased back onto the road. In about an hour we came to a nice US Army Corps of Engineers (COE) campground on the Mississippi River where it is impounded by a hydro dam. Even though there were only 19 campsites Kit and I were able to score one of them for the evening. With a beautiful view of the Pokegama Lake out our front window. 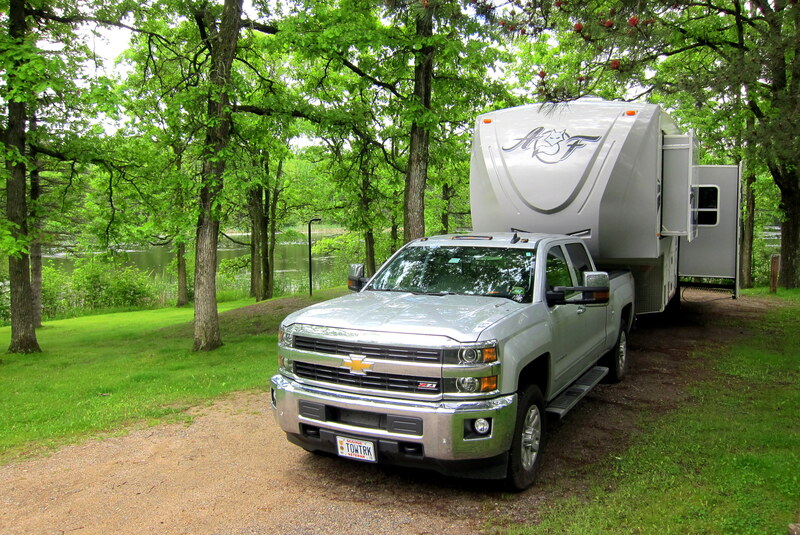 After a walk about the grounds and a nice meal we settled in for the evening listening to the flowing water of the mighty Mississippi outside our camper. 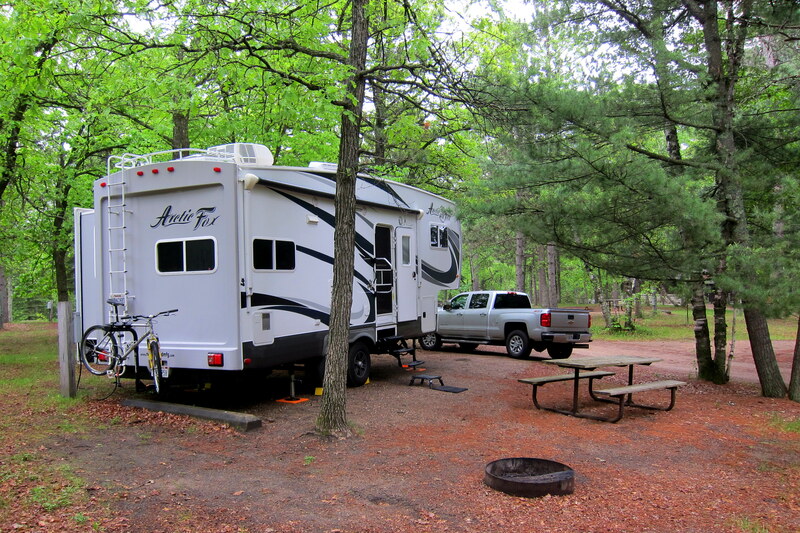 Sunday, June 7, 2015: Kit and I would have loved to stay right here at Pokegama Dam Campground for another night or two…..it was beautiful and being a federal facility our senior passes resulted in half price site fees! 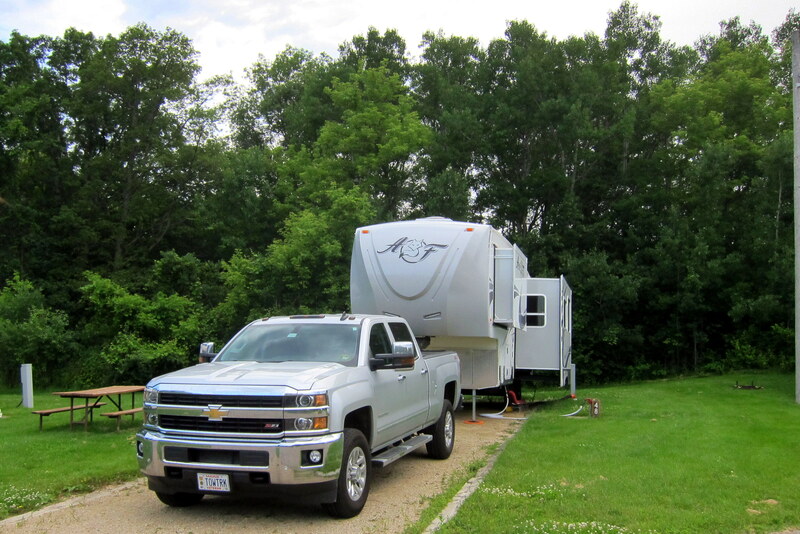 However contrary to our preferred method of travel, we had made reservations for a five day stay in a very popular community campground just south of the twin cities, so reluctantly we rolled out in late morning and continued our travels. The weather had turned out nice and the temperatures were a very pleasant 70 degrees as we came to the town of Grand Rapids and stopped for a quick walk about the downtown area. Grand Rapids with a year round population of about 11,000 folks came by its name due to the large rapids on the Mississippi River which prevented the rivers steamboat trade from continuing any farther north. 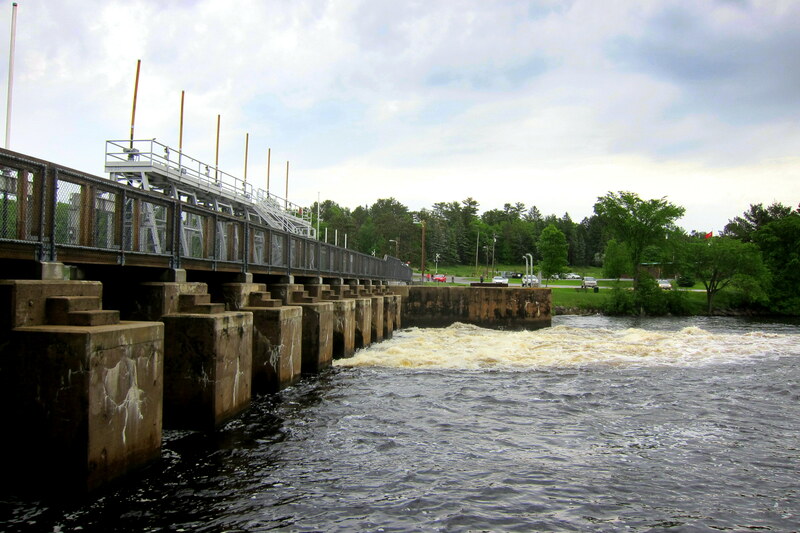 The rapids are now tamed due to a series of dams built in the ensuing years. A nice little town with a relaxed vibe, it looks like yet another place that deserved exploring a bit more thoroughly, but alas we needed to keep rolling along. However on our way out of town, we did make a brief stop at the childhood home of Judy Garland, one of Grand Rapids favorite daughters. 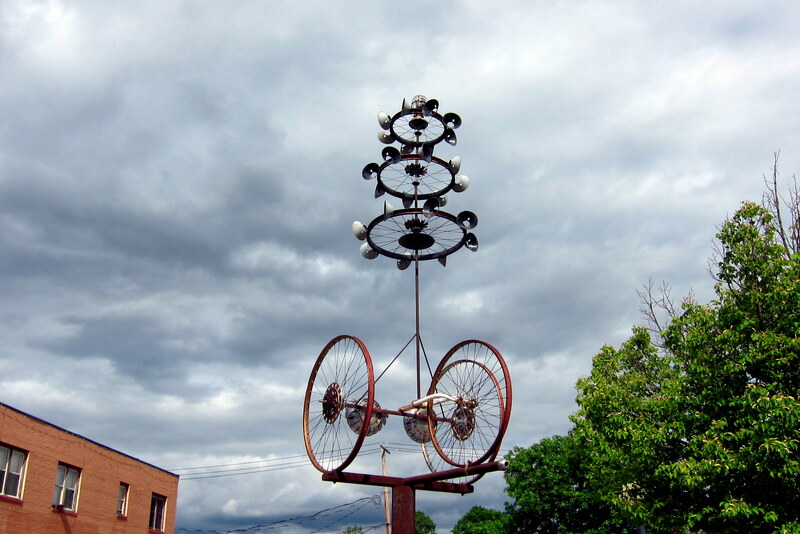 Moving over to US Highway 169, Kit and I headed south around Mille Lacs Lake and at around 1700 we entered the congestion, confusion and aggressive driving that only a city of three million souls can provide. 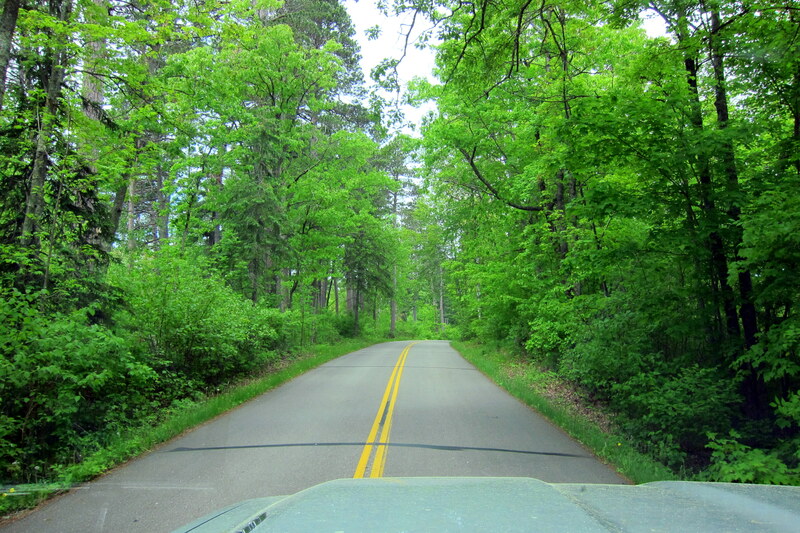 As we white knuckled our rig through the traffic and construction detours we were relieved to finally roll into the twin city bedroom community of Apple Valley and our home for the next few days…..Lebanon Hills Regional Park. Backing into our site, I detected some movement in the grass right behind the gravel pad. Investigating, I noticed this little mom laying her eggs in a pit of mud she had created by bringing water from a nearby pond. Following this interesting and natural spectacle, mom covered the nest with vegetation and with great effort dragged herself back to the pond. Visibly exhausted…..she was a shell of her former self (pun intended). 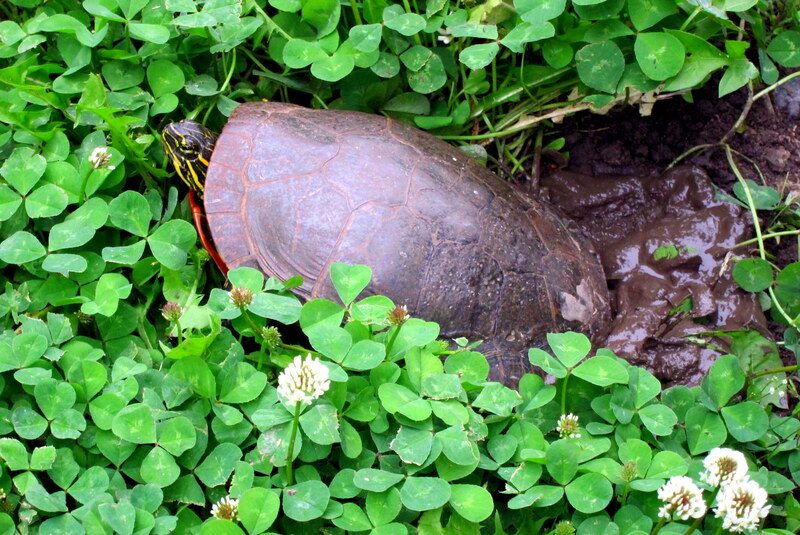 I hope there’s a four leaf clover surrounding that nest as there are a number of critters in the woods that would love a turtle egg breakfast! 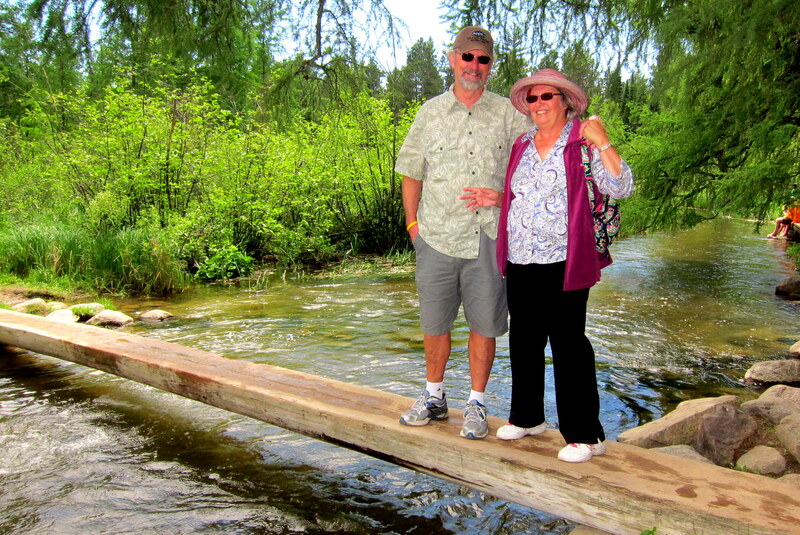 Monday, June 8 through Thursday, June 11, 2015-Lebanon Hills Campground, Apple Valley, Minnesota: While here, and over 1,500 miles from home, we received the devastating news that our daughter-in-laws mother had lost her courageous battle with cancer. 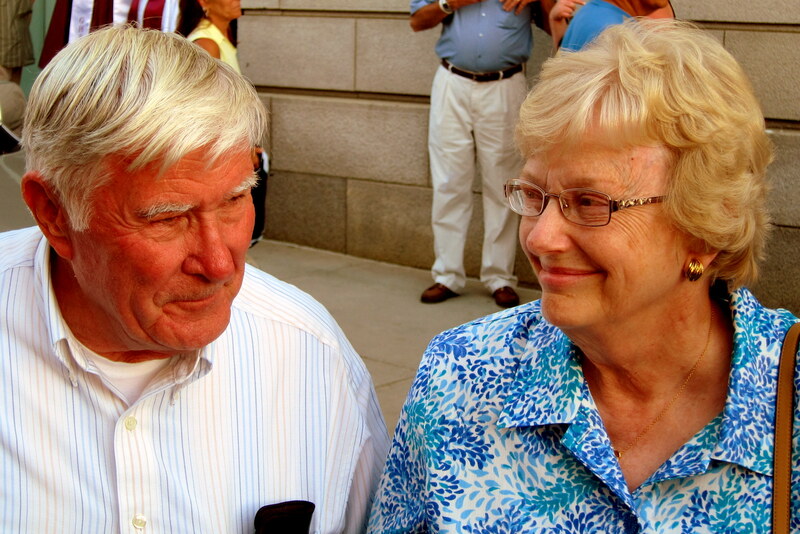 Betty, shown above with her husband Monk, was an incredible woman of faith and grace. As a career Army wife she made a home for her husband and four children at various locations around the world. Betty was also an educator, helping to shape the future citizens of our country. The world is a little bit poorer with the loss of this caring and lovely woman. Kit and I will miss her deeply…..our condolences and loving thoughts go out to the entire family. Our stay in the twin cities of Minneapolis-Saint Paul is to be marked by visits with Kit’s family as well as a very special lady. Henrietta was a true friend to my father, helping to make his final days comfortable and peaceful. I will always be grateful for the loving care she provided him. Following my dad’s passing two years ago, she found companionship with Bob, an accomplished musician and genuinely nice fellow. 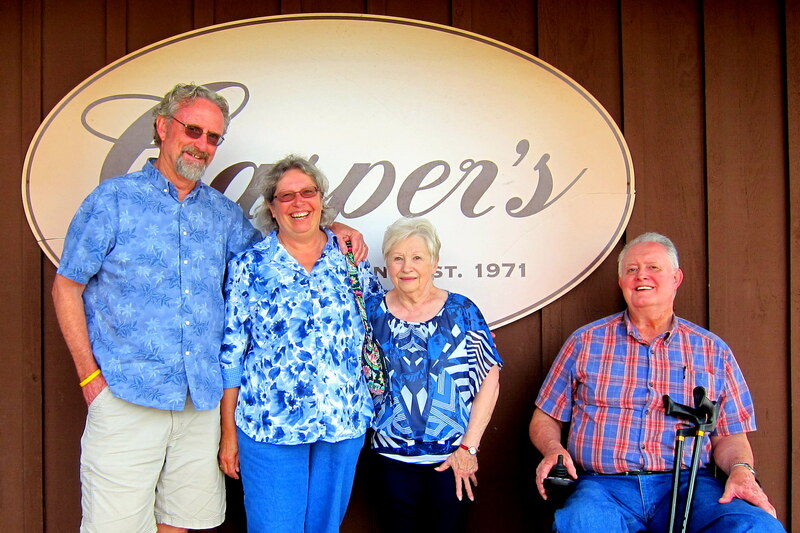 We enjoyed a great meal with Henrietta and Bob at a local restaurant and spent a number of hours visiting and getting to know Bob. 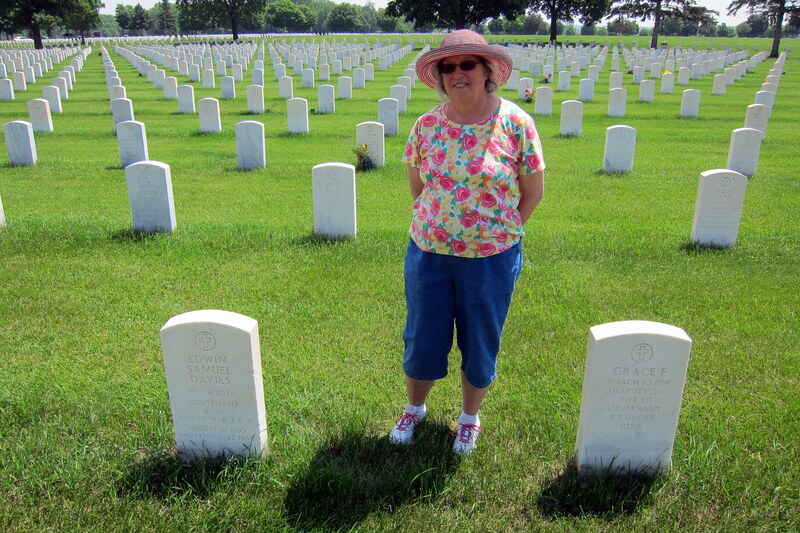 Later, Kit and I drove out to Fort Snelling National Cemetery to pay our respects to my father. 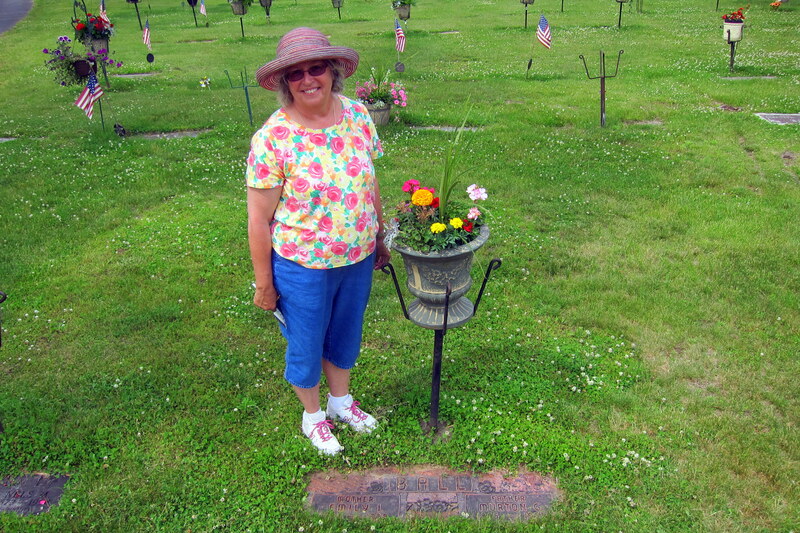 While there, Kit and I were pleased to visit her paternal grandparents’ grave as well. It was a pleasant and reflective day; one that proves yet again the fragility of life and reinforces the philosophy to live every day to the fullest. 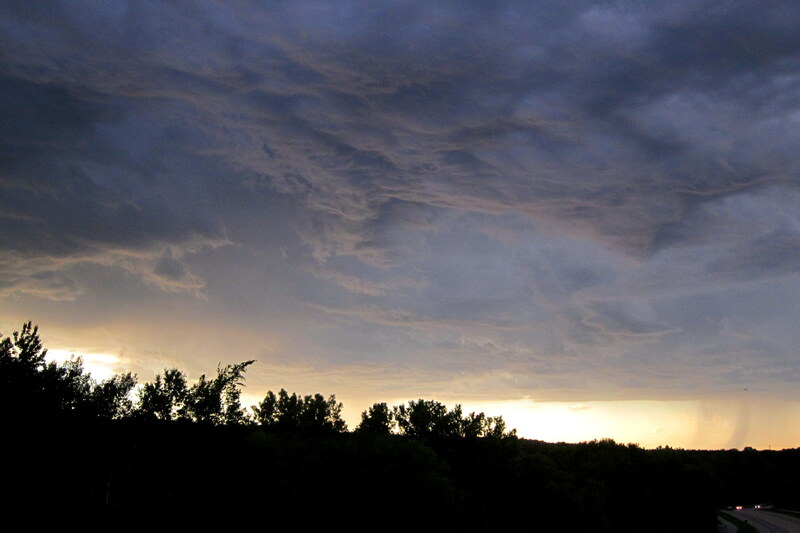 The weather during our stay for the most part was warm and dry, but one afternoon a huge thunderstorm popped up seemingly out of nowhere! 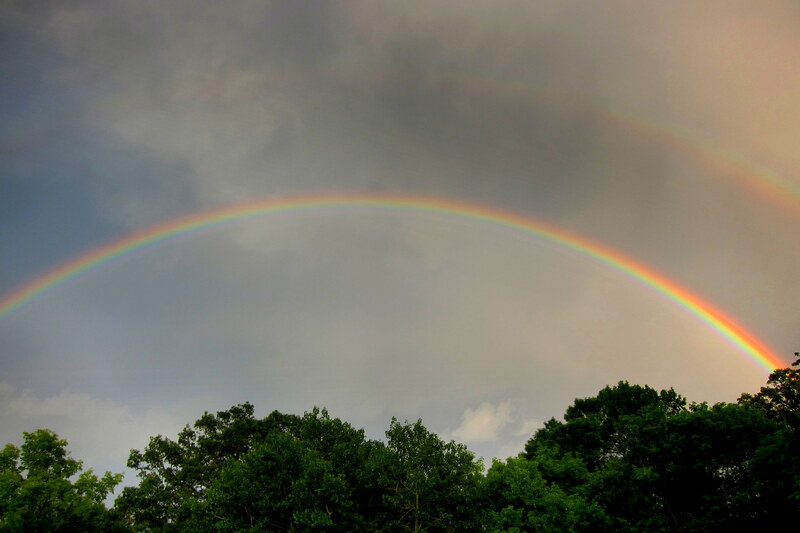 All heck broke loose, then just as quickly the sun reappeared and a beautiful double rainbow followed the storm as it exited to the east. 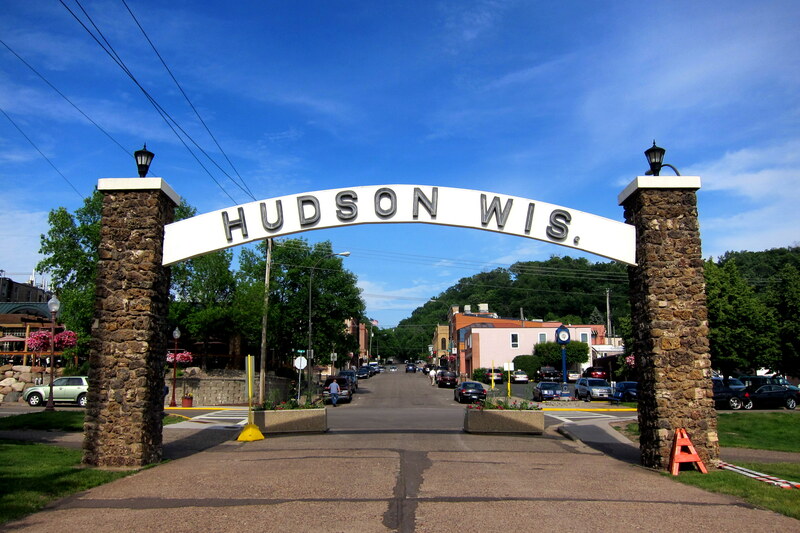 Keeping with the passed relatives theme, Kit and I also made a pilgrimage to her ancestral home of Hudson, Wisconsin just across the St. Croix River from the twin cities. There she wanted to pay her respects to departed relatives that had helped shape the woman she is today. However, the local cemetery, unlike the military uniformity and computerized precision of Fort Snelling, was a bit chaotic. We wandered about for a good half hour failing to find a single family gravesite. A passing local took pity on Kit and me and brought us to the caretaker’s home. Mike Miller has worked at the cemetery since high school and is its sole full time employee. Known about town as “Digger” (honest! 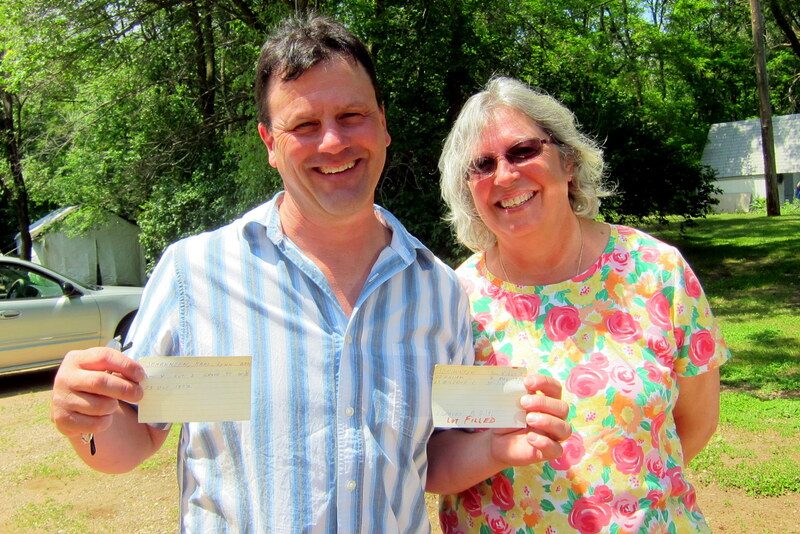 ), he stopped what he was doing, went into the garage and pulled some old yellowed index cards. On these quaint vestiges from administrative accounting was all the information on Kit’s relatives! And since the graves were not laid out in any sequential order, and since there were no informational signs, Digger led us to each and every grave Kit was seeking. 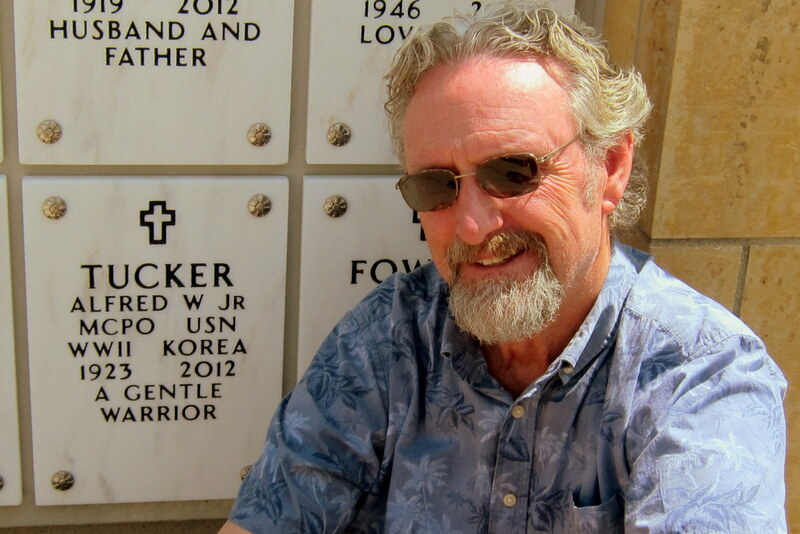 In addition, since he knew every family in town, Digger proceeded to tell a few stories about each one of Kit’s interred relatives…..ya gotta love small town America! Since it was time for lunch, Digger steered us to the best spot in town for a meal and some local beer. 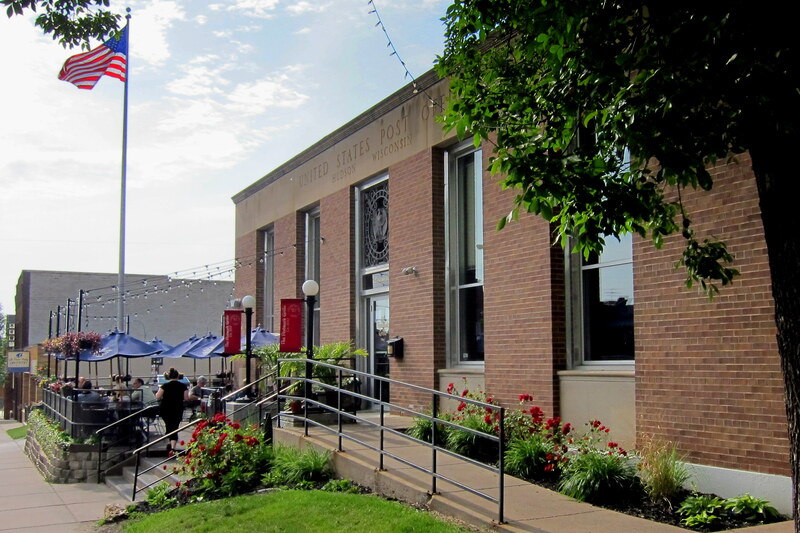 The old US Post Office had closed some years ago and a quirky tavern had moved in. The Postmark Grill still had many of the trappings of a post office and featured a great menu of unique tavern food. Kit had the Grilled Chicken Sandwich and I ordered a family sized Buffalo Chicken Pizza. And no, I did not eat that entire pizza, a big part of it came back to the camper. 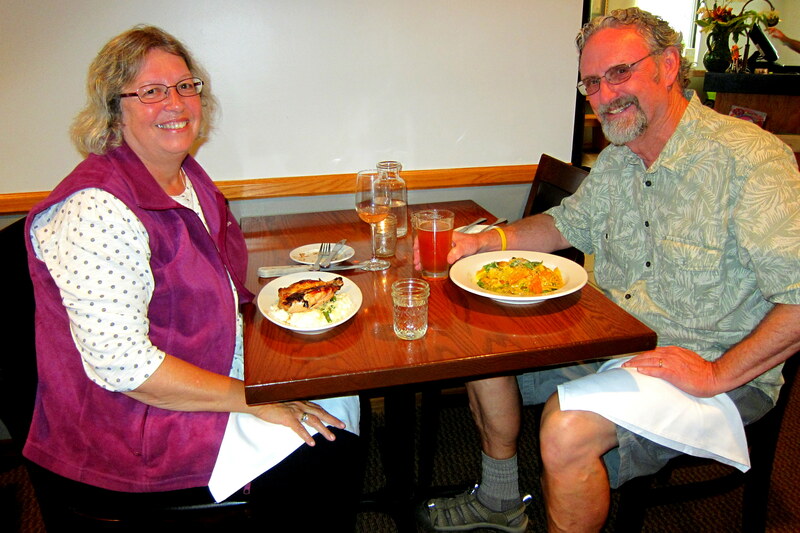 Kit and I enjoyed another full lunch the following day…..and it was just as good! After the meal, we walked about town and visited some shops before returning to Apple Valley for the evening. Tomorrow, we hit the road once again for a trip to Blaine, Minnesota. Why? Well, stay tuned! Kit’s Bit’s: This segment of our journey has been most interesting! First of all, I LOVE being in Minnesota since it’s where I’m from originally. Bemidji and Grand Rapids are towns my dad used to talk about when I was a kid. He worked for the Highway Dept. and traveled through the state on different jobs. It was so nice to finally see the area! 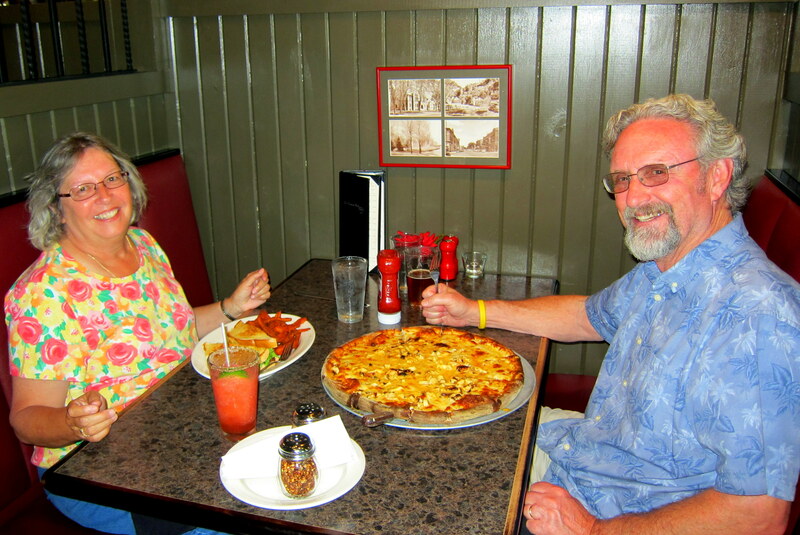 And, since we were about to celebrate our 50th Anniversary, and, I was unsuccessful at finding a treehouse rental, Bemidji was the next best place! On to the Twin Cities and Hudson, it was great to see Henrietta and my relatives, also nice to see Bill’s dads spot at Fort Snelling as well as my grandparents and uncles graves. Over in Hudson, we always go by my Grandma’s and Aunt Millie’s homes. With some help from our new friend, Digger, we were able to find my maternal grandparents graves as well as some other relatives. As I mentioned earlier, I always feel “at home” in this area since I spent my first nine years there. 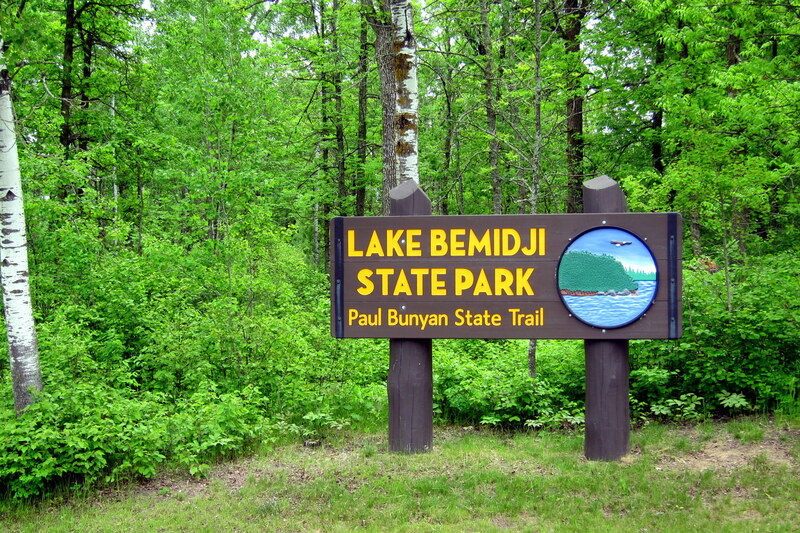 I always wanted to see Bemidji since we had close Navy friends from there, many years ago when we were all stationed in Moyock, NC. Sorry to hear about Ann’s mother—–please give her our condolences. You blew it……. you could have eaten fresh Apple Valley turtle eggs for breakfast! It’s a known aphrodisiac in northern Maine. Why do you think Vicky and I had 17 kids? Hey, you’ll eventually make it back to Maine. I’ll buy you a turtle egg breakfast. What a great segment! 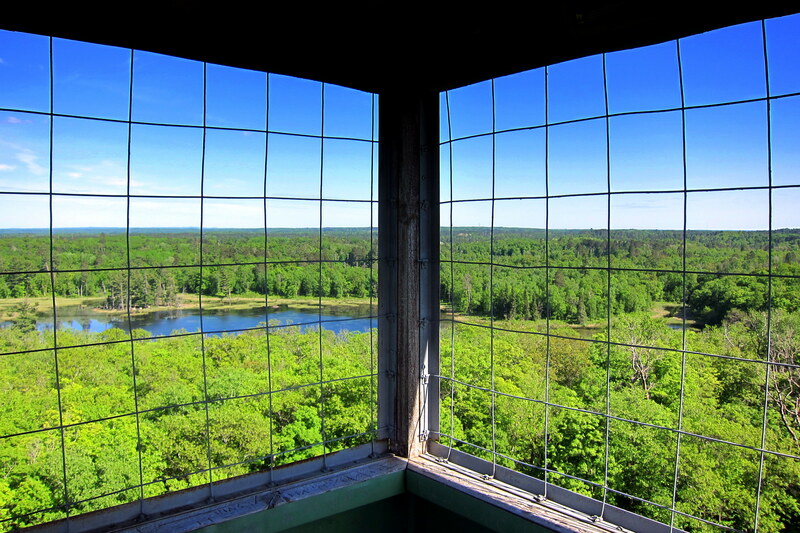 Kit made it to Bemidji, a 50th Reunion and Cheese Nips were enjoyed, our resident thrill-seeker got to climb a creaky service fire tower, loving gravesite visits and a stop at ancestral Hudson, Wisconsin! You guys must get terribly bored once you return home!